Frances Brody is my guest on the blog today. Frances writes the Kate Shackleton Mystery Series set in Yorkshire, featuring First World War widow turned sleuth, Kate Shackleton. 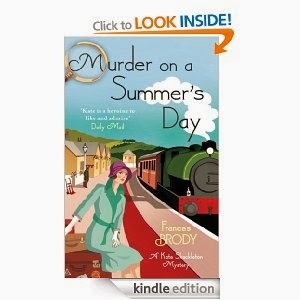 The fifth novel in the series, Murder on a Summer’s Day, came out in October (and I notice has five star reviews on Amazon) and will followed by Death of an Avid Reader in October. In the US, the third novel, Murder in the Afternoon, will be published on 11 February. I didn’t set out to write historical crime but looking back can see how history and crime collided. An early story, written in my twenties and broadcast on BBC radio, centred on a Hong Kong policeman investigating a case of infanticide. (I’d never been to Hong Kong but my sister had). As a student working in London during the summer vacation, I spent time in the British Museum Reading Room, in thrall to an account of the 1612 Pendle witch trials in Lancaster. The drama was palpable and deeply moving. I could hear the women’s voices across the years. The trial transcript gave me characters, story and location. Wider reading supplied background and a modern take on how and why events unfolded as they did. The Sun and the Devil became a play for BBC radio, a great medium for travelling back in time. Family stories took me to the Great War, the twenties, thirties and saga writing. I don’t think in genres though; I think in stories and characters. When I turned to crime, it was because I had a picture in my mind of a man who could not return to his family. Who’ll solve this, I wondered. Step forward Kate Shackleton, First World War widow turned sleuth. When I wrote history/drama scripts for BBC Schools programmes, I checked every fact against three sources. Writing a novel is different. I do my best to be faithful to my period, but I am a storyteller, not a historian. I write to entertain, engage and to play the game of make-believe. What matters most is story, character and, because the Kate Shackleton mysteries are crime novels, a touch of tricky plotting with twists and turns. It helps that I enjoy visiting locations, reading literature and diaries of the period, dipping into contemporary newspapers, looking at old maps and geekily checking train times in my ABC Railway Guide. Unfortunately, the universal truth about writing historical novels is this: you will be wrong about something you thought you knew, or took for granted. Someone will spot the mistake. Reviewing the first Kate Shackleton novel, Dying in the Wool, the Country Life reviewer said, ‘My only cavil is that the heroic dog is a Weimaraner (like my own), which I don’t think were seen out of Germany until the end of the next war.’ She was right. I had researched Kate’s background in nursing, the cameras she used, intricacies of the woollen and dyeing industries, the explosion at a nearby munitions factory, and then tripped over the dog. Having a mistake pointed out is good for a writer. She won’t make the same mistake again. Next time it will be something new, different, and even more annoying. Very interesting interview and insights into writing historicals. I love the Kate Shackleton books anyway, but it's always good to know a bit of the inside story on how things came about. And the moral of this post is, never work with pets! And probably children. Great interview, and it was fascinating to learn that Frances wrote scripts for the BBC's schools programmes. The experience of diverse backgrounds. I wish you well with the new book, Frances, and thanks, Christine, for hosting her on your blog. Thank you both. Good to hear from you.